Happy New Year! With this greeting, you may be checking the date to see if you skipped a month or if, like Rip van Winkle, you slept through the last five weeks. If you are beginning this lesson on the first Sunday of Advent, you may be saying, “Ha, the publishers and author have made one big scheduling mistake if they think this Sunday is the beginning of the new year.” It is no mistake. These lessons are the beginning lessons for the new year, that is, the new Christian Year. Advent, the celebrating of Jesus’ first coming as an infant, has for centuries been the holiday signaling the beginning of the Christian calendar. Virtually all of us use some type of calendar to organize and order our lives. So, the question is not whether we use a calendar, but whose we will use. As Christians, the journey we make through a year should first be organized around the same themes of faith that inspired our Christian ancestors. The year should reflect the biblical and historical stories that make each of our days special in their dedication to God. 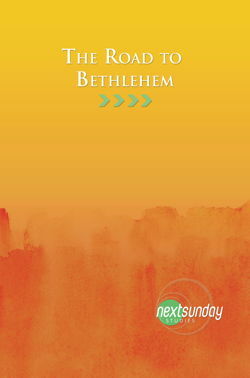 So, it is appropriate to begin our new year with an Advent celebration that takes us on a journey to Bethlehem. During this Advent season, our journey is prepared not only by the Christian calendar but also by the writer of Matthew’s Gospel. For any traveler willing to ponder, the Gospel writer has many insights on this journey. The first stop on this journey is Matthew’s perspective on the proper balance between living for the future and living in the present. Session two finds us standing on a riverbank listening to John the Baptist: “Repent for the kingdom has come near” (3:2a). John’s message is a continual call for reformation and transformation in our lives. The third session on this journey explores John’s doubts about Jesus’ identity. The fourth lesson brings us finally to the town of Bethlehem where all humanity is challenged by a newborn infant named Emmanuel. Session five is for all travelers who on the journey of faith encounter potholes and obstacles or who, like the character Christian in John Bunyan’s The Pilgrim’s Progress, find themselves in the “Valley of the Shadow of Death.” It is a reminder that when Emmanuel is with us, there is always divine guidance for the journey.